Gamavor, we love you. But, don’t you think the above story belongs in under the subject topic of Mythology? Not any different from the legend of Noah having named Yerenan when he yelled “yerevats” and landed in Nakh-ijevan! Also remember when the “only begotten son/miatsin” descended/ejav/էջավ/ իջավ” upon “Ej-miatsin. Yes, we know that Plutarch and others have told Hannibal’s story. Which cable channel were his exploits documented and aired? The only thing they don’t tell us is which airline jet did he fly on. Survey the map below. Let us see how an army of 60,000 (another mythical number, like te vatsoum hazar zinvorner at Avarayr) and 10,000 elephants would travel 2000 miles west from what is today Tunisia, all the way to the Gibraltar, a 1000 miles north over the Pyarennies, another 1000 miles east, over the Alps, to Rome. Mind you, the legend does not say that he crossed the Mediterranean to Sicily etc. Lest we forget that some "odars" know more Armenian history than many of us. Just like the time when this highly educated (PHD History) African American woman, who upon learning that I was Armenian, brought up the story of Hannibal and his connection to Armenia, yet she ended up the story emphasizing the fact that Hannibal was an African. Did he have elephants like the one below? To not forget the 10,000 elephants in the Battle of Avarayr. To continue. When Hannibal did not get the help he hoped, he fled yet another 2000 miles to Armenia. Where, after a couple of days knew the geography and the military needs of his host country.??!! In all fairness. The above is such an entertainingly titillating bedtime story, not unlike the story of Noah who, according to legend was 500 years old during the flood, and that he built an ark to accommodate two of every species, yet to this day no one has told us where he bought the lumber, home Depot or Lowe’s,and where he got the electricity for his power tools. No wonder nobody takes us and our so called “history” seriously.!! Edited by Arpa, 06 October 2007 - 06:37 PM. By horses I guess?! Traveling was painful but not imposible. How do you think the Roman legions travelled all the way to Armenia? By the time it was known that Vologases of Parthia was approaching with a huge army, Paetus' force was much reduced. Against better counsel, he led his understrength legions out to do battle in the open. "Then, after losing a centurion and a few soldiers he had sent in advance to reconnoiter the enemy's forces" he seems to have panicked, and ordered a hasty retreat to the camp. There he dispersed his already insufficient force in a series of outposts and detachments. The romans skirmished desultorilly, while Vologases attacked the scattered outposts in detail. Many men fought bravely against impossible odds, but the best and most courageous were the first to fall. Under such incompetent leadership and seriously short on supplies, the legions' morale shattered. Paetus pleaded with Corbulo, in Syria, to "come with all speed and save the standards and Eagles." But Corbulo moved slowly, wanting to make sure his rival, Paetus, was sufficiently discredited before he came to the rescue. Vologases assaulted the camp vigorously, "seeking to bring them to an engagement. But the men could hardly be dragged out of their tents, and would merely defend their lives, some held back by the general's order, others by their own cowardice." Paetus, meanwhile, entered feeble negotiations with the Parthian king. He finally agreed to leave Armenia, and swore before the Eagles that Romans would never return. The legions' humiliation was complete. Even before they withdrew, the Parthians entered the camp unopposed. They took clothes, weapons, anything that took their fancy. "The soldiers were utterly cowed and gave up everything so as not to provoke a fight." Vologases made great piles of the bodies of the slain Romans and of the arms his army had captured, as testimony to his victory. Then he turned his back, and would not look upon the shattered men of the 12th and 4th legions as they slunk away. And they left quickly, 40 miles in a single day, Tacitus tells us, leaving their wounded behind to the mercies of the enemy. Corbulo, at last advancing to the rescue, came upon the refugees on the banks of the Euphrates. He ordered the eagles of his legions covered, so as not to witness the shame of the defeated. "His men, in true grief and pity for the lot of their comrades, could not even refrain from tears... pity alone survived, the more strongly in the inferior ranks." Later, when Corbulo led his legions back to Armenia to take revenge upon Vologases, neither Legio XII Fulminata nor Legio IV Scythica would accompany them. He judged that "from the loss of their bravest men and the panic of the remainder, (they) seemed quite unfit for battle." Both legions were sent back to Syria, in disgrace. Once again a little caution and a hefty grain of salt are in order, before we lowers our vartiks and bare our behinds. It goes on to say that, ever since then Plutarch has been treated not so much as an historian but an essayist, biographer whose main objective was to highlight the exploits of the Greeks and Romans and use them as a medium to aggrandize them, use them as models of integrity and morality to inspire the masses. In other words, and these are my words ”he was just a propagandist, not an eyewitness historian”. We will also notice that he lived some 300 years after the saga of Hannibal. (247-183 BC). Where did he get his stories from? How? And what were his objectives? According to Armenian sources, Khorenatsi does not mention Hannibal or his involvement in Artashat. Had he not heard of Plutarch, did he dismiss him as an unreliably biased source? Once again, according to Armenian historians Plutarch is viewed with a jaundiced eye, to say the least he is not known for his armenophilia. Arpa, I agree about Plutarch. He is not very trusted in the history society even for description of events to which he was witness. The point of interest however was the transportation means and how exactly remote geographically regions have displayed certain cultural similarity. If you look at the map it takes not a very long shot to get from Italy to Armenia by the sea. Ah, the Sea! That's what Cicero exclaimed in one of his oratory, emphasizing the importance of the sea as a mean for exchanging ideas, culture and goods. Even by land, although a stretch for sure but still not impossible. A dumbass turk one time in a different forum asked my how come Armenian have in their national cuisine mussel soup or mussel dishes, when they don’t have a sea. The scum-back didn’t know that Armenians were inhabiting the shores of three seas long before his Mongol ilk showed up in Asia Minor. Whyis Kanan/Kanaan is still a popular surname of some Syrians, Lebanese/Paletinianis? When I was only 8 years old , when our Sunday School teachers would tell us stories abot David and Goliath, Samson (Phoenician, Canaanite, ՜Փղշտացի/Palestinian, Gazan) and others idiots, I could not help but see pictures of Mickey Mouse, Donald Duck and other cartoons. And now. Let us talk about that other “mickey mouse” aka Korenatsi whose main mission was to hebradize/christianize?) our history, mythology and ancestry. And now, the entire world believes , specifically us, the Armenians that we are descendants of that idiot Noah, and that the Canaanites, the Phoenicians, the Philistines, the Palestinians, and eventually the Carthaginians were an anathema. That Book of Lies is assumed to be the most read . Can I have my say? Can we burn all those “books” (the so called Old Testament, not the New) and use them as a source of heat for freezing homes in Hayastan? If only I had my way, I would declare Khorenatsi the traitor of all times, who, in his fervor of an agent of that newfangled religion trashed our history in favor of thoae idiots of Abraham and David, either of which has yet to be historically and archeologically proven. Edited by Arpa, 08 October 2007 - 09:44 AM. * Steven Sim is creator of "Virtual Ani"
before Mr. Sim ever set foot in present-day Armenia. the destruction of the Julfa Armenian graveyard. replacing it with a pitched stone roof. of workmanship and lack of understanding of Armenian architecture, Mr.
after restoration, then it should not be restored." around, to be lost or stolen; they should be preserved in a museum." six-meter-tall, 12th-century khatchkars -- remarkably still standing. woman who lived a clandestine existence as a male monk. repairs are done," he said. to encourage their ongoing maintenance. most people in Turkey do not see any value in preserving old things. could be done to preserve the monuments. to the upkeep of the monuments. support do we give Armenian scholars and researchers?" buildings, and Armenians who visit them are treated with suspicion. Edited by Arpa, 06 December 2007 - 05:54 PM. Tourists familiar with Scottish heritage would be astonished to discover the possibility of famous Stonehenge been originated in Armenia, claiming the fact that the Armenian land is the real cradle of civilization. Famous professor and world’s known specialist on stone monuments Gerald. S. Hawkins had acknowledged that Karahunj is 7,500 years old, which means that it is 3,500 years older than Scotland Stonehenge, older than Karnak in France and Newgrenge in Ireland. It may prove what some people already suspect that Armenia is the cradle of the civilization. On the territory of 7 hectares, 223 huge vertical stones like soldiers stand on the hill, some with holes pierced in them. The rough- cut stones aligned irregularly for a purpose, 84 were found to have holes. Many unique astronomic instruments consisting of one, two or three Stones were identified and using these, many observations of the Sun, Moon and stars. It is commonly assumed to be an early observatory, the evidence of ancient astronomical culture in Armenia. These stones have been attributed with mystical and cosmic powers. The Armenian scientists in ancient times could accurately measure latitude, knew that the Earth was ball-shaped, had an accurate calendar, and many more. The sight is beautiful and ancient, well worth the visit. Astronomers from Europe and the US are showing increasing interest in the complex, and several expeditions have already taken place. To compare Armenian Karahunj with Scottish Stonehenge visit Welcomearmenia.com for its unique images. For experience you can take guided tours to the ancient sophisticated observatory of Karahunj with 7Days... Armenian Travel Company. Multi-language guides will describe and explain the mystical meanings of the Armenian Zorats Karer, the oldest observatory of the world. Did you know that there is a Village of Karahunj in Artsakh too? I didn’t. Stonehenge," but known locally as Carahunge, as a tourist site. holes of 4 to 5cm in diameter, directed at different points at the sky. for maintenance and security of the site. name of sunrise and lunar phases and the day when a year began. the region, placed them inside the holes for magnification. UNESCO World Heritage Site in 1996.
but it is believed to have been used as a temple or an observatory. Residents of Koti Village, Tavush Region accidentally discovered an ancient construction which is likely to have been a pagan or pre-Christian temple. As Governor of the village Felix Melikyan states it is more than 8 meters in length. Local residents were afraid to dig it out as they might damage the monument. The Governor has addressed to the Armenian Institute of Archeology with the request to carry out excavations at the site. The archeologists are expected to arrive at Koti village on June 15. 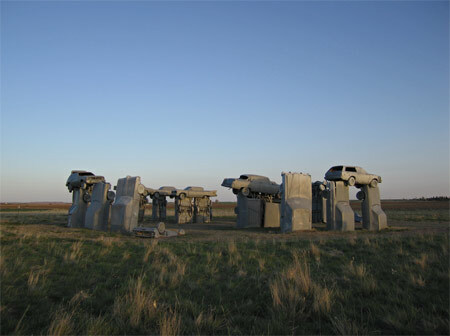 The oldest Stonehenge in the World !!!! Armenia or England??? is the cradle of the civilization. some with holes pierced in them. The rough- cut stones aligned irregularly for a purpose, 84 were found to have holes. Many unique astronomic instruments consisting of one, two or three Stones were identified and using these, many observations of the Sun, Moon and stars. It is commonly assumed to be an early observatory, the evidence of ancient astronomical culture in Armenia. These stones have been attributed with mystical and cosmic powers. The Armenian scientists in ancient times could accurately measure latitude, knew that the Earth was ball-shaped, had an accurate calendar, and many more. Edited by Sip, 16 June 2008 - 10:47 PM. Hi Sip! You, stonehead! I mean cheesehead. Are we going in a full circle around, in this 21st century? Going back to the STONE AGE, better known as "SILICON"??? Edited by Arpa, 18 June 2008 - 06:19 PM. As a result of three weeks' diggings in the frontier Village of Koti associate member of the RA National Academy of Sciences (NAS), archeologist Aram Kalantarian and head of the archeology and ethnography institute of NAS, Ph.D. Suren Hobossian have discovered several churches and khachkars (stone-crosses) dating back to 6-7c., 12-13c. and 16-17c. The diggings, performed with private funds, are presently discontinued. They will continue next year, when the Government invests funds from the State Budget. ** Թումբ means “mound”/ հողակոյտ, as in "dam" against water: Does it sound like the English “tomb, pr. toomb” to mean “ceremonial burial place/monument” like the Armenian “շիրիմ”? More info and pictues needed! See how, at times it is written as (Georgian? Vratseren? )“TmogvԹմոգվ/Tmovg Թմովգ”. Is it because some may have read the Ւ of ՈՒ as Վ, the "hyun" U as V? Edited by Arpa, 17 September 2008 - 08:05 AM.